A lot of my reading lately has been sending me rather pointed messages along the lines of "Wake up!" and "Get out of your rut!" and "What are you so afraid of!?" 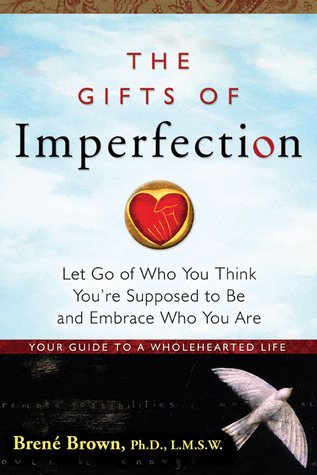 Dr. Brown's The Gifts of Imperfection is another to add to that list. It's a comparatively short book - 130 pages - but, to my chagrin, she manages to cram a whole lot of rather uncomfortable "aha!" moments in. In a lot of ways, this book reads for me almost like a sequel to the Curse of the Good Girl, which I reviewed a couple of months ago here. Growing up I was focused on what others thought of me. As a people-pleaser, that was how I established my sense of self-worth, by making sure I was doing what I "should" be doing, looking how I "should" look, getting the grades I "should" get, regardless of what I liked or wanted. I'm not even sure I knew what it was I really liked or wanted a lot of the time; I was too busy worrying about what others wanted, though I tried to hide that fact. In addition, I was often incredibly hard on myself. I would beat myself up over every little mistake, reliving my errors and imperfections, stupid things I said, answers I got wrong on tests, assignments that could have been better. I put a great deal of energy into projecting a "perfect" and happy image to the world, convinced that if people knew the "real" me, they wouldn't like me. It's taken me years to train myself out of those thought patterns, and they still creep in occasionally when I'm not vigilant in combating them. The Gifts of Imperfection is kind of a cheat-sheet, a cheat-sheet I wish I'd had starting in middle school if not earlier, on how to develop the skills needed to live authentically and joyfully. 10. Cultivating Laughter, Song, and Dance: Letting go of being cool and "always in control"
Of course, these traits come more easily to some people than others, but Dr. Brown assures us that, through both her research and personal experience, these qualities can be learned. Adequately covering all ten guideposts would result in a book review almost as long as the book itself, and I suspect that different points would jump out at you during your reading than those that bowled me over during mine. As we're all on our own unique journeys, with our own set of weaknesses, vulnerabilities, and fears, this book may have absolutely nothing for you. Or it may have so much that it's overwhelming to try to figure out where to start. I'm going to share with you just a few of the thoughts in this book that were particularly powerful for me. I've been pondering a great deal about faith lately, and I'm beginning to see it in a very different light than I used to. When I read the quote from Richard Rohr above, it clicked. I don't like the unknown. I like questions that have one right answer, preferably an answer that is fairly simple to find. Unfortunately, life is not often that neat and straightforward. It takes humility to acknowledge the uncertainty, and faith to meet the uncertainty head on. Faith strikes me as a decision to believe, but in conjunction with the doubt, not in its absence. If we didn't have doubts, faith wouldn't be a struggle at all; it would hardly even be a choice. Sometimes the word "faith" is used, especially in religious settings, to mean something closer to "knowledge" or "surety" than I think is intended. A verse from The Book of Mormon spells this out explicitly: "faith is not to have a perfect knowledge of things" (Alma 32:21). In that same chapter, the prophet Alma uses an analogy to illustrate that what we call faith isn't a single, set entity; rather it's a continuum that starts with "no more than desire to believe" (Alma 32:27) and extends to the point where "your knowledge is perfect in that thing, and your faith is dormant" (Alma 32:24). Looking at faith as a spectrum rather than a monolithic quality opens up some breathing space for our imperfections and doubts and questions. It refuses the demand for an unforgiving all-or-nothing worldview, and allows for individual variation on the journey. I'm one of those who has said "I'm not very creative." I don't draw or paint or sculpt. I definitely don't knit or sew, though I used to cross-stitch. My home decorating skills are minimal. I tried scrapbooking for a while and it fizzled out before my second child was born. I do enjoy singing, but in recent years I've lost a good chunk of my upper range, I suspect due to lack of use, and don't feel comfortable singing solos anymore. My piano playing is utilitarian, accompanying choirs or congregations at church rather than really creating something artistic of my own. My undergraduate degree was in theater and that was a major focus of my life for years, but I haven't acted on a stage for more than a decade now. A few years back, President Dieter F. Uchtdorf gave a talk in General Conference, directly to the women of the Church, about creating. In it he said, "Creation means bringing into existence something that did not exist before—colorful gardens, harmonious homes, family memories, flowing laughter. What you create doesn’t have to be perfect...Don’t let fear of failure discourage you. Don’t let the voice of critics paralyze you—whether that voice comes from the outside or the inside." So I write. I garden. I cook (sometimes). I spend time with my children and husband, creating and strengthening family bonds. I teach my son to play the piano. I plan and teach lessons at church and at home. I organize and coordinate and gather, making order out of chaos, at least temporarily, and forging connections with others. And I don't do any of it perfectly, but I'm trying to embrace the imperfection and enjoy the creation.